185 Gorbals Street formerly called Main Street, Gorbals. The Glenbervie. Thanks to Tich Keltie for this great image. Gorbals Street was once called Main Street, Gorbals and for well over 100 years has been well provided for old men's pubs. The Glenbervie was just one of these public houses. When this photo was taken Hugh Gallagher was the licensee. The history of this old Gorbals favourite started in 1868 when spirit merchant John Clement obtained a licence to sell beer and spirits. Mr Clement lived not far away and stayed with his family at 198 Crown Street. The address of the premises then was known as Upper Main Street. After five years trading, the pub was taken over by George Shaw. George only had the pub for a year, the reason for this has been lost in the history books of Glasgow. On 22nd April 1874 a well-known wine and spirit merchant Andrew Riddell took over the running of the pub, he paid an annual rent of £111.00 which was a great amount for a pub in the Gorbals. Andrew's rent was reduced to £93- 10 shillings after the First World Far and continued to serve the locals until 1921. Other licensee to hold the licence was James Murdoch 1923 to 1927. Francis Evans during the 30s and 40s, he also ran a pub at 114 St James Road. In the 1950s Hugh Robb owned the pub then Mr Hugh Gallagher a popular Irishman who arrived to Glasgow from Donegal. Mr Gallagher became very popular in the Southside of the city. He was friends with most of the Irishmen in the area including his friends Eddie Boyle, James McCready and Hugh Bonner. 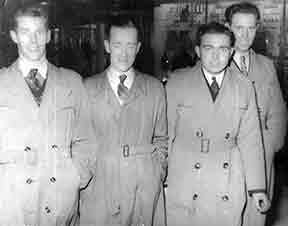 Left to right young Hugh Gallagher, unknown, James McCready and Edward (Eddie) Boyle. Do you known the unknown man 2nd on the left? All the above men were from Donegal. Thanks to Tich Keltie. Hugh Gallagher was a very successful businessman and had some of the best pubs in the Gorbals including, Gallagher's Bar at 631 Argyle Street, Anderston, 32 Raglan Street, The Tirconnail Bar, 173 Cumberland Street and The Govanhill Bar, 332 Thistle Street. 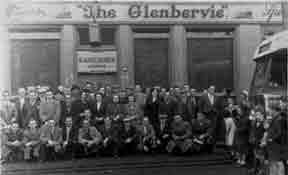 Hugh's friend James McCready took over the Glenbervie Bar in 1963. Mr McCready was also the licensee of the Tolbooth Bar, 11 Saltmarket at Glasgow Cross.